I am developing an open-world action adventure game, Acropora: Defender of the Reefs, that will highlight the relationship between humans, pollutants, climate-change, and coral reef extinction. I hope to help players understand the real consequences of climate change, while demonstrating how human actions influence all different forms of life. 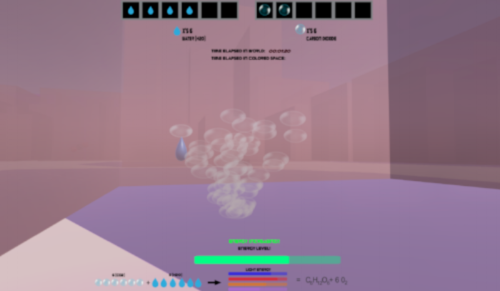 In addition to implicitly teaching players about the relationship between carbon emissions and rising water temperatures, the game aims to teach responsibility and encourage empathy. FlaVR Factory is a virtual reality video game that I have been developing to help pediatric cancer patients regain their appetite. The game takes place in a world created solely by food. There are multiple levels within the world that players can conquer. Players must find and gather ingredients (food objects) through exploration and adventure. Think of it as an enhanced virtual hide and seek and capture the flag! The game mechanics I have chosen, were specifically incorporated in order to expose players to as much food as possible and encourage the act of eating. The game components are tailored to evoke hunger from players by exploiting psychological tactics proven to make people hungry (color schemes, auditory elements, visual stimulants, shapes, etc.). Though the target audience is currently pediatric cancer patients, this solution could apply to any child who has eating disorders or further difficulties with eating. Energy Explorers is a digital game designed for elementary schoolers learning about photosynthesis. Keeping in mind different learning theories, such as scaffolding and situated cognition, the game manipulates different learning methods to help facilitate teaching the process and elements of photosynthesis to young learners. The premise of the game: Players are trapped in a maze. Different sections of the maze contain different elements of photosynthesis: Water, Carbon Dioxide, and Sunlight. The player must navigate the maze in order to stay alive and collect appropriate amounts of each element. 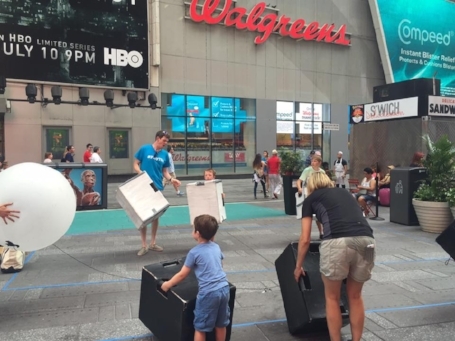 PlayTimesSquared was a 3 day game festival created by NYU students and NYU Professor, Greg Trefry. 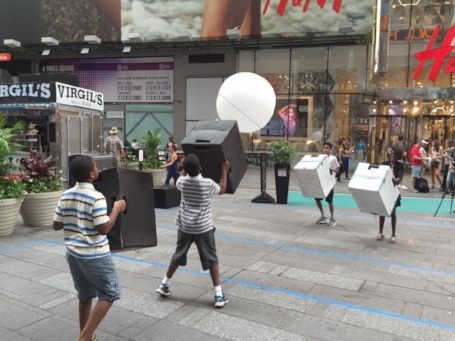 This event was a collaboration between Times Square Alliance and NYU's Game Center. My specific role in this event was working in a group of three, creating a real-life spin off version of Atari's 'Pong'. We were featured on NY1 News, TimeOut, and several other media outlets, with a total of 67,667,455 media impressions! Over the course of 6 months, I was given the opportunity to create table-top and playground games for kids, ages 4 - 12. Though these projects were often small scale, they were incredibly valuable as they provided me with practical insight into how children learn, play, and interact with the environment around them. I was fortunate to design games for a diverse group of children. Animal Run is a simple matching game that requires coordination and speed. This game was designed for children around the age of 4. The last two games, BattleBlocks & Roly Poly were tailored specifically for children with learning disabilities.